If you’re a first-time mom and don’t have any idea what it is, then let me tell you this: you’re going to need it! Diaper bag backpacks are special bags that have been designed for parents like you, so you'll have space for baby stuff and other essentials. Though they may look like an ordinary bag, they can help you more than you can imagine. I must say it's a God's sent from heaven to make parenting easier. However, the only problem is that it is quite difficult to choose one due to thousands of diaper bags available in the market today and every product is offering endless possibilities. So which one to choose? How can you begin your journey of finding the best diaper bag backpack? Keep on reading to find out! We've finally made it to the list of the best diaper bag backpack in the market. Check out below and find the one that you think would be suitable for you and your baby's needs. Bag Nation Diaper Bag Backpack is on top of my list. Bag nation has been known for producing durable and high-quality products. They always aim to offer a guaranteed satisfaction. I like how this backpack provides what high-end products can provide, but at a very low price. I believe its 12 pockets are enough to meet your needs too; it is currently the product today that provides this most number of space. The package also includes changing pads, sundry bag and different straps, making the whole product better and more useful. Most of all, this bag is unisex, so daddy will no longer be shy of carrying the diaper bag. I can say that Graco Gotham Smart Organizer System Back Pack Diaper Bag is truly a great companion of every on-the-go parents. The space it provides is massive so it allows you to store all your baby stuffs merely in a matter of seconds. Most of all, it is affordable. It is actually a whole lot cheaper compared to any diaper bag backpack. But don’t get me wrong, even it if it has lesser cost, it provides almost every feature that expensive ones have. If you think that all the diaper bags in the world are boring and plain looking, well Ju-Ju-Be B.F.F. Convertible Diaper Bag is the one that’s going to break the tradition. What I like about this product is that it comes with unique features and modern design. It’s just really impressive and original. There are also three exterior pockets and seven interior ones that can practically make your life easier. Furthermore, there is also a great addition of bottle compartment. The bag is made of Teflon fabric which is a particular type of material that can be easily washed and cleaned. The material also made the bag more resistant to stains and minor damages. This product is very similar to Ju-Ju-Be B.F.F. Convertible Diaper Bag; however, they have an entirely different design. 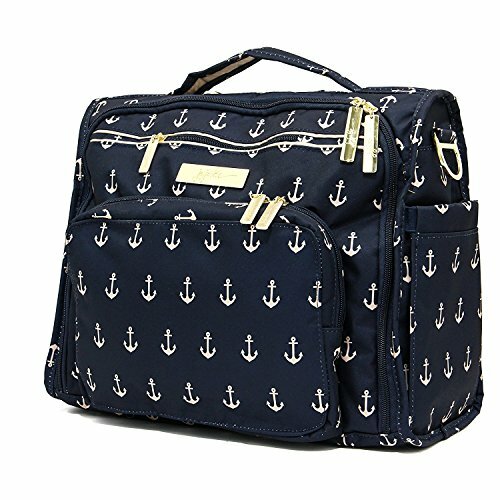 Unlike the unique patterns of the diaper bag mentioned above, Ju-Ju-Be Legacy Collection B.F.F. 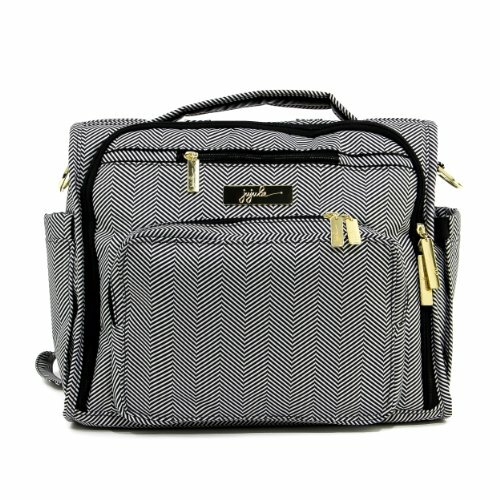 Convertible Diaper Bag has an elegant design. It also has three exterior and seven interior pockets, along with the extra bottle pocket, making it 100% convenient to use no matter where you go. Another feature of this diaper bag is the Agion natural antibacterial treatment that will make sure that the lines of your bag are safe from mold, germs and bacteria. You will also find drain holes in the back pocket of the bag which is intended to get rid of crumbs. If you're one of the parents that constantly need their gadgets, then this backpack is for you. Skip Hop Forma Backpack provides a space not only for your mobile phone but also for your laptop and table. At the same time, you can also carry a bottle. I like how this bag maximizes its practicality. What's even great is that the bag doesn't look like it's made just for diapers. The shoulder straps are also insulated and come with cushions so you can carry it for a long period without any difficulty. This diaper bag is also BPA free; it means that it is made free of any allergic-causing materials. So there you have it, the best diaper bag backpack available in the market today. I hope this article has helped you come up with the best decision. Take note that choosing a diaper bag is something that you should do seriously since this is not a product that you are going to use occasionally. Anyway, the Bag Nation Diaper Bag Backpack is simply the winner for me. Its practicality and affordable price make it the best choice. Plus, it is durable and has a great design. How about you? Which diaper bag do you think would suit your needs best? Let me know by leaving some comments below. Why Should You Buy Diaper Bag Backpack? Let me share with you some of the reasons why I love diaper bag backpacks and why I am recommending it to you! Here are the advantages of using this type of diaper bag. 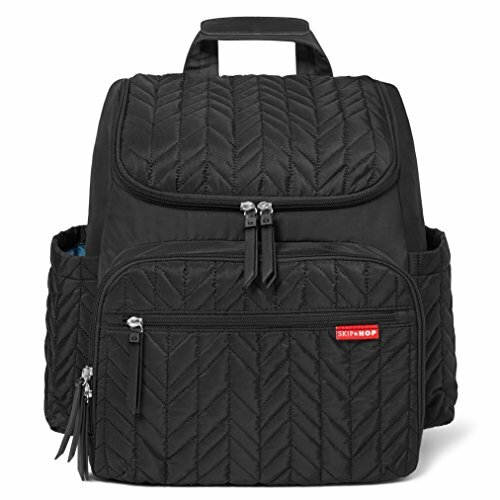 I find diaper bag backpack so comfortable since it frees both my hands, plus there is no need to worry anymore for any shoulder straps sliding every time I am chasing my toddler. I love how it allows me to do so many things at the same time. I don’t have to perform the balancing act of having my little on in one hand and the other hand keeping my bag from falling off. Most diaper backpacks generally come with plenty of compartments that are very spacious to accommodate every baby must haves for first time moms. Also, I like how it keeps my baby stuffs neat and organized. I always quickly find what I want without the need of tirelessly searching the whole bag. I heard it most of the time that fathers hate carrying diaper bags because they usually don't look too manly. Good thing the backpack ones have gotten rid of this issue. There are even some that don't look like diaper bags at all; daddies can now confidently carry it now everywhere. There are lots of best places to travel with baby. However, travelling with our little ones only means holding her all the time in our arms. If you have to carry a diaper bag on our shoulder at the same time, it will only get uncomfortable. Furthermore, doing this for a longer period will even lead to a shoulder strain. Fortunately, diaper bag backpacks eliminate this problem since it evenly spread the weight of the bag on both shoulders. So before I reveal to you the best product among the thousands of diaper bag, let me share with you some tips on how to choose a diaper bag backpack. I once made a mistake of buying a low-budget diaper bag before, and it was so annoying how quickly the zippers and straps got broken. So I recommend that you invest in a diaper bag that comes in good quality. A product that could last for at least two to three years is a good choice, especially if you’re planning for another child some time soon. Is Key If you're just a first-time mom, I'm sure you will be surprised at a number of things you will need to be hauling around to provide your baby's needs. 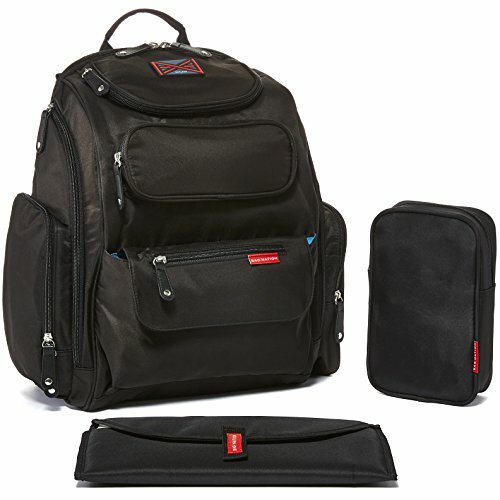 So when looking for the best diaper bag backpack, you need to consider the storage. This does not limit to the bag’s capacity to bring all the things you need but as well as how organized it can be. The best bag will be able to fit all your things and at the same time can be easily accessed. I recommend you chose a backpack that comes with padded straps; this will save your shoulders whenever you are carrying a fully packed bag. When it comes to choosing colors, dark ones are much better than light ones. But if you're really in love with a light colored backpack, I suggest that you check the washing instructions; the product should not require you so much time and effort just to clean it. Take note that you will be dragging this bag around so that it will most likely be exposed to dirt. I strongly recommend that look for a bag that is easy to maintain. It would be awesome to choose to wipe clean linings or the water and strain-resistant exterior fabric, but a bag that you can just toss in the washing machine is a bomb! It would be best that you purchase one that your husband will like to carry around as well. After all, this can be a bag where he can place the new dad's survival kit. So, ask for his suggestions on color or what design he likes. Both of you should be comfortable to bring the bag. And oh, don’t forget to share this article with your friends too!